Following The Dinner Party, between 1980 and 2000, as Director of Artsreach, a non-profit based at UCLA, Ms. Hill originated diversified and multi-lingual artist residency programs for a large cadre of collaborating artist teams. Programs were specialized for institutionalized populations, gang youth, and marginalized urban constituencies. Ms. Hill is the author of a needlework text book for a PBS education series (Los Angeles Daytime Emmy), has been a teaching Artist in Residence in California working with older adults, incarcerated adults and juveniles, pregnant teens, teen parents, and inner city first generation children. Ms. Hill was an instructor at Otis College of Art and Design, L.A.
She recently moved to Belfast, Maine, and is accountable to one white and one black poodle. In 1984 Juliet Myers established Art/Artist Care, a business offering organizational and curatorial services to artists in Santa Fe, NM. 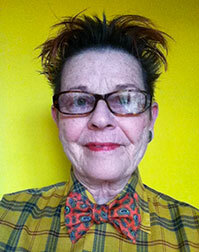 Subsequently she worked as assistant and studio manager for Judy Chicago, Rick Dillingham, Herbert Lotz and Bruce Nauman. She continues in her capacity as Nauman’s studio manager today. From 2003 through 2012 Myers served as SITE Santa Fe’s Director of Education and Public Programs. In 1990, she founded Fine Arts for Children & Teens, Santa Fe’s award-winning visual arts program for youth, and spent 12 years as Founding Director and Lead Instructor for its school-based and studio programs. In Los Angeles from 1977-1982, Myers worked as a researcher and photographer for The Dinner Party project. She received her B.A. in Education from the University of Kansas and M.A. in Printmaking at the University of Missouri – Kansas City. 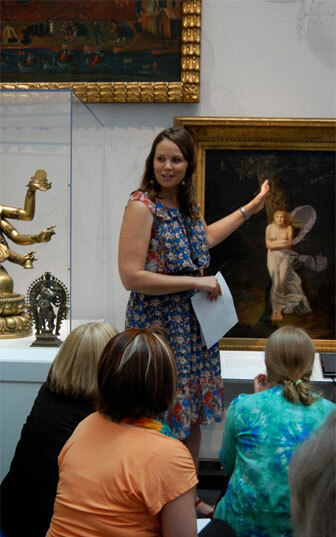 Myers serves on the Educational Advisory Council for the PBS series Art21 – Art in the Twenty-First Century. Diane Gelon was awarded a Bachelor of Arts degree from the University of California at Los Angeles in 1970. She then went on to graduate school in Education also at UCLA leading toward a secondary teaching certificate. Following that she spent over three years on a PhD program in Art History at UCLA completing all required coursework and French language exams stopping short of writing her dissertation. She left graduate school in 1976 when Judy Chicago asked her to do a little research for a couple of months on women’s history for a project she was working on. Within a month she realised that Judy needed more than just a researcher and she self-appointed herself as the Project Administrator of The Dinner Party and took on the task of raising funds, managing the studio environment, and then ensuring that the work remained visible when the institutions refused to show it. Ten years later that “project” had travelled to three continents and a dozen venues – She worked with art museums, community organisers, fundraisers in all cities where The Dinner Party travelled. While organizing The Dinner Party tour she returned to graduate school in 1981 to take a law degree at the Cardozo School of Law, Yeshiva University in New York and graduated in 1984 with a Juris Doctor degree. She then attended the London School of Economics, University of London and was awarded a Masters of Laws degree in 1986 (as a way of staying in the UK while she organized the Edinburgh, London and Frankfurt exhibitions). She was admitted to the New York State Bar in 1987. Diane Gelon now lives and works in London. 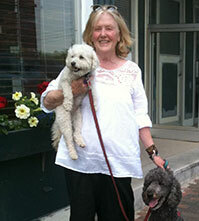 In 1991, she established her own practise, Law Office Diane Gelon. Generally she advises on international tax and commercial matters. She also has a specialist niche practise in advising companies and individuals who work in the entertainment industry. She handles legal work on film productions and has several feature film credits as “production lawyer” and “associate producer”. In addition, she provides tax advice to American actors working in the UK and British actors working in the US. "And there are many days that I wonder why the heck I am a lawyer!" 2012 particpants are led through an analysis of key artworks throughout the Brooklyn Museum.